E-OCVM (Version 2) Explained Episode 3 - CAATS II Final Dissemination Event Alistair Jackson EUROCONTROL Episode 3 Brussels, 13 & 14 Oct 2009. 2 Episode 3 - CAATS II Final Dissemination Event 2 Operational Concept Validation What is it ? … and why do we need it ?  When we intend to develop and implement new operational systems we need evidence to support investment decisions.  We need to know that any new operational change: - will bring the performance benefits we require; - will be safe in operations; - Will be compatible with other system elements, and - will be usable and acceptable by the operational staff, pilots, controllers, etc., who will use it. Concept Validation is about identifying, collecting and structuring the necessary evidence. 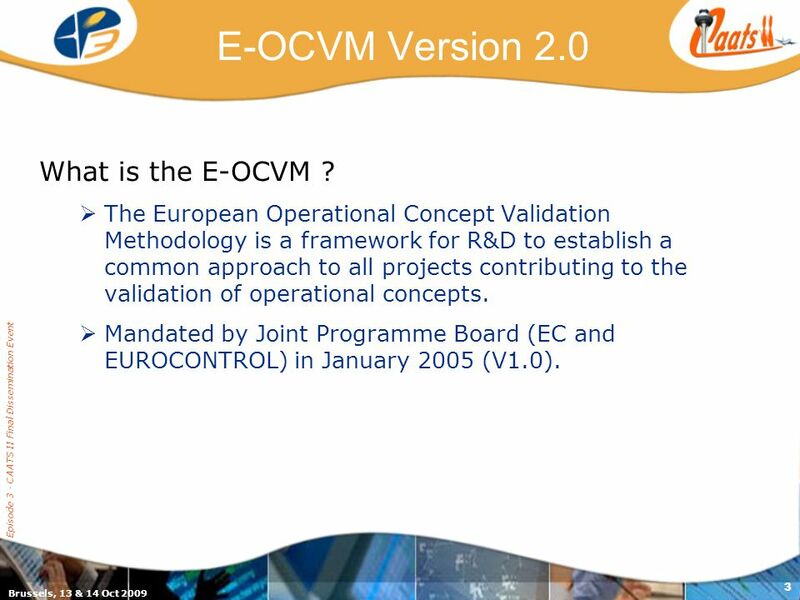 3 Brussels, 13 & 14 Oct 2009 Episode 3 - CAATS II Final Dissemination Event 3 E-OCVM Version 2.0 What is the E-OCVM ? 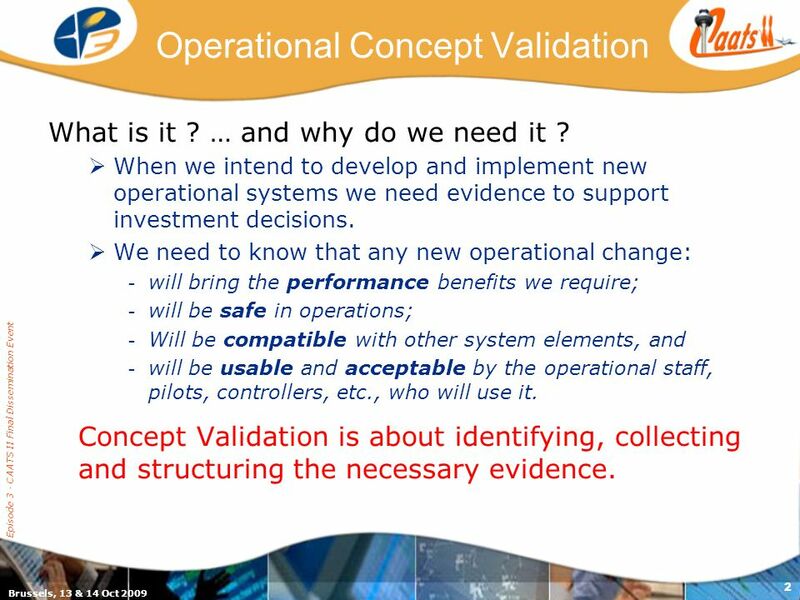  The European Operational Concept Validation Methodology is a framework for R&D to establish a common approach to all projects contributing to the validation of operational concepts.  Mandated by Joint Programme Board (EC and EUROCONTROL) in January 2005 (V1.0). 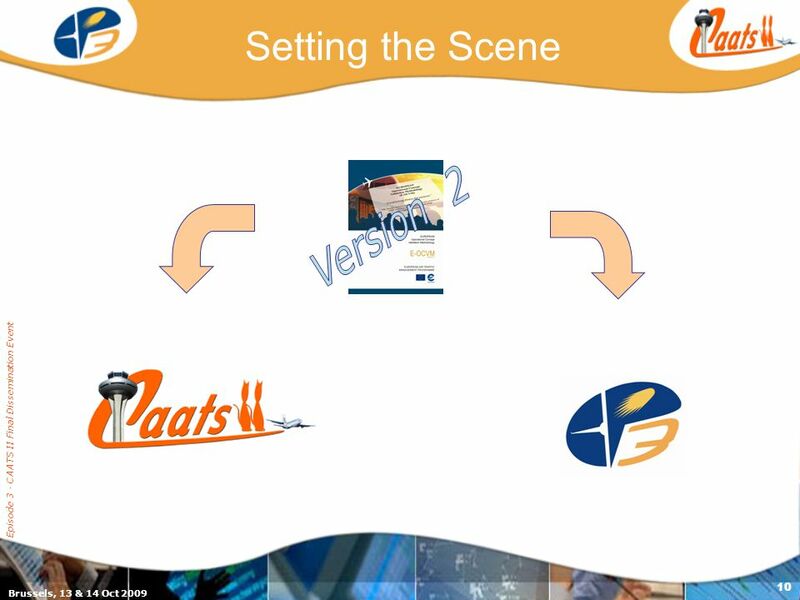 4 Brussels, 13 & 14 Oct 2009 Episode 3 - CAATS II Final Dissemination Event 4 E-OCVM Version 2.0 Where did it come from ? 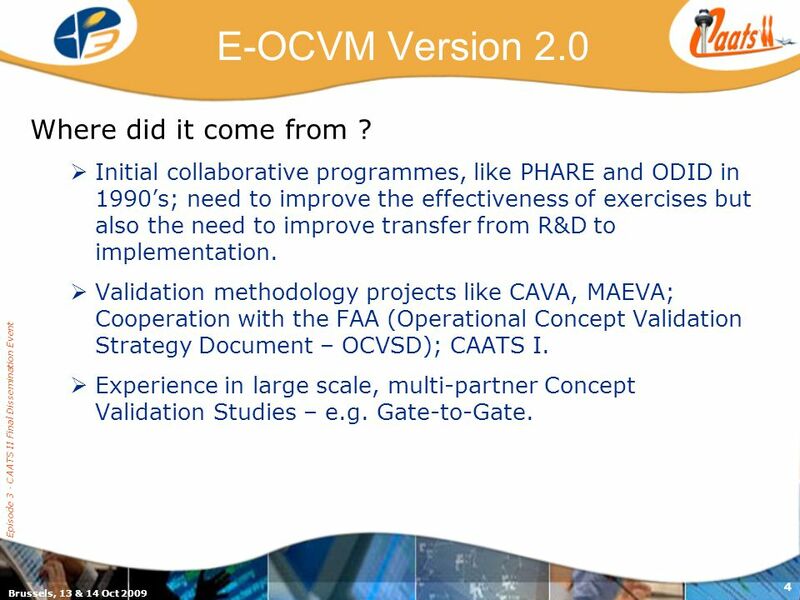  Initial collaborative programmes, like PHARE and ODID in 1990’s; need to improve the effectiveness of exercises but also the need to improve transfer from R&D to implementation. 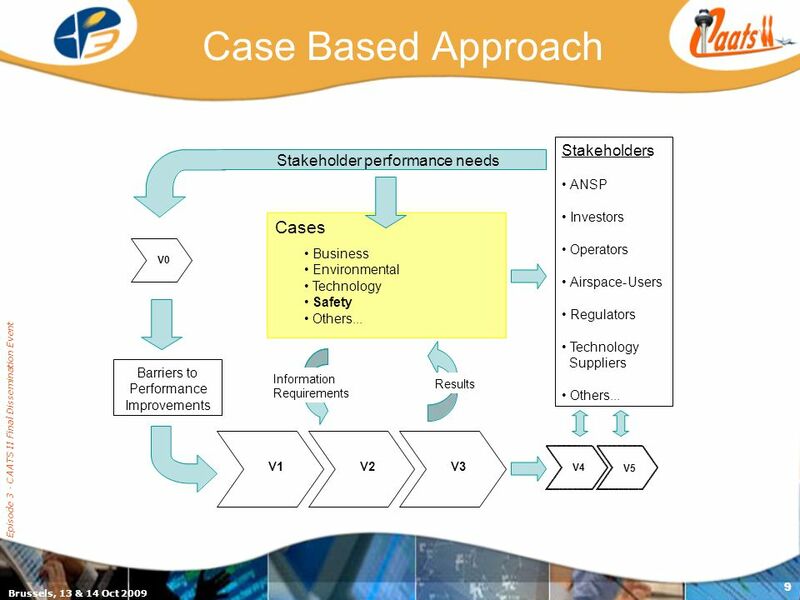  Validation methodology projects like CAVA, MAEVA; Cooperation with the FAA (Operational Concept Validation Strategy Document – OCVSD); CAATS I.  Experience in large scale, multi-partner Concept Validation Studies – e.g. Gate-to-Gate. 5 Brussels, 13 & 14 Oct 2009 Episode 3 - CAATS II Final Dissemination Event 5 What does it consist of ? 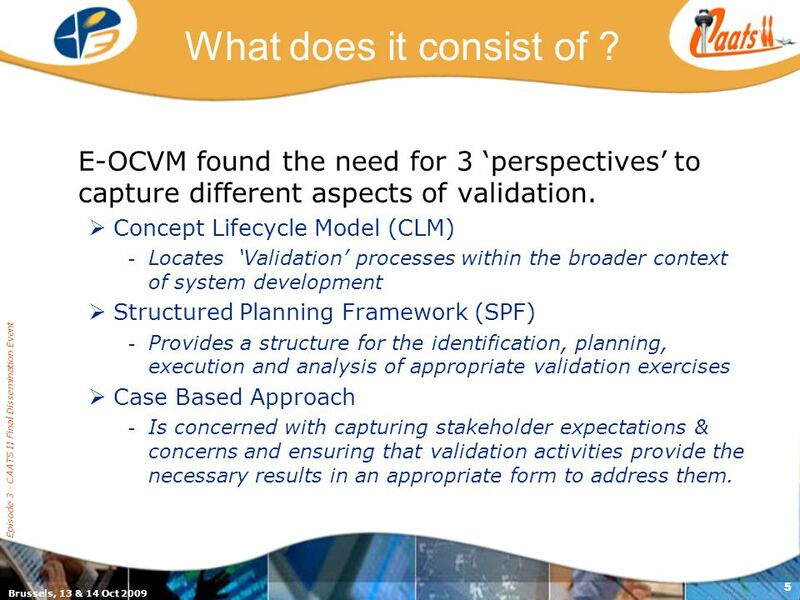 E-OCVM found the need for 3 ‘perspectives’ to capture different aspects of validation. 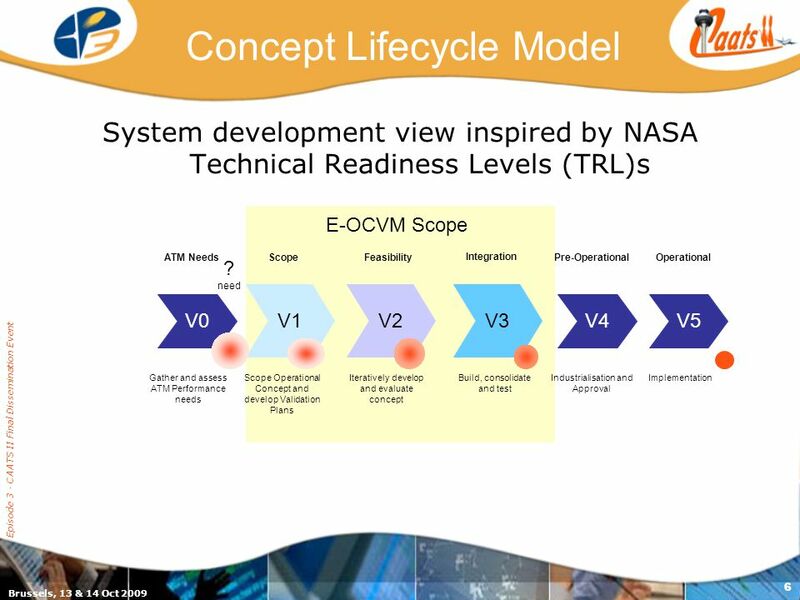  Concept Lifecycle Model (CLM) - Locates ‘Validation’ processes within the broader context of system development  Structured Planning Framework (SPF) - Provides a structure for the identification, planning, execution and analysis of appropriate validation exercises  Case Based Approach - Is concerned with capturing stakeholder expectations & concerns and ensuring that validation activities provide the necessary results in an appropriate form to address them. 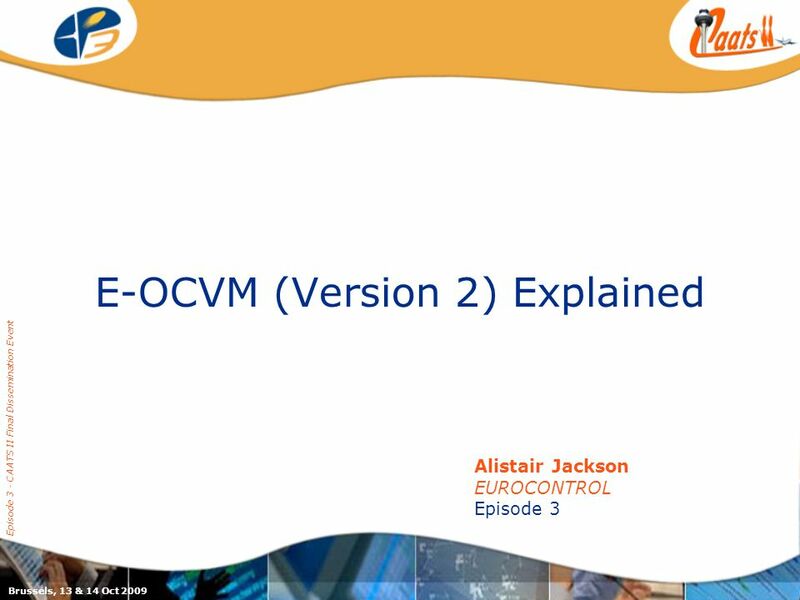 Download ppt "E-OCVM (Version 2) Explained Episode 3 - CAATS II Final Dissemination Event Alistair Jackson EUROCONTROL Episode 3 Brussels, 13 & 14 Oct 2009." TVET working group contributions. What are the possible options for obtaining decent living and working conditions without joining the informal economy? VARTAN – Validation Reporting Templates Jürgen Teutsch, NLR CAATS Workshop, 16-Feb-2006, Lanzarote. SCG/ May 2008 Item 2.2 – AP01 Deployment of the ATM Master Plan IP1 Dimitris APSOURIS EUROCONTROL DAS/SIS. © 2002 EUROCONTROL 1 One Sky for Europe EUROCONTROL CARE/ASAS ACTIVITY 2 FOLLOW-UP: VALIDATION FRAMEWORK DISSEMINATION FORUM Validation Data Repository. 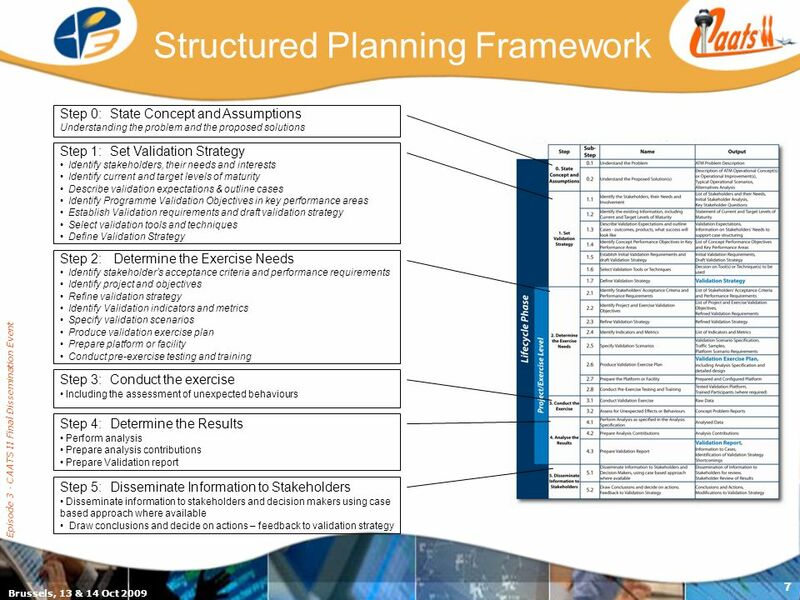 The EMERALD RTD Plan and the ASAS Validation Framework R P (Bill) Booth 10 October 2002. Expert Groups in Episode 3 Episode 3 - CAATS II Final Dissemination Event Raquel Garcia Isdefe Episode 3 Brussels, 13 & 14 Oct 2009. The Performance Framework Episode 3 - CAATS II Final Dissemination Event Laurent Tabernier EUROCONTROL Project Episode 3 Brussels, 13 & 14 Oct 2009. TITLE OF PROJECT PROPOSAL NUMBER Principal Investigator PI’s Organization ESTCP Selection Meeting DATE. Introduction Episode 3 - CAATS II Final Dissemination Event Martijn Koolloos Isdefe Episode 3 & CAATS II Brussels, 13 & 14 Oct 2009. Enav.it Session 3 Steps towards the SESAR deployment and the ATM system modernisation. 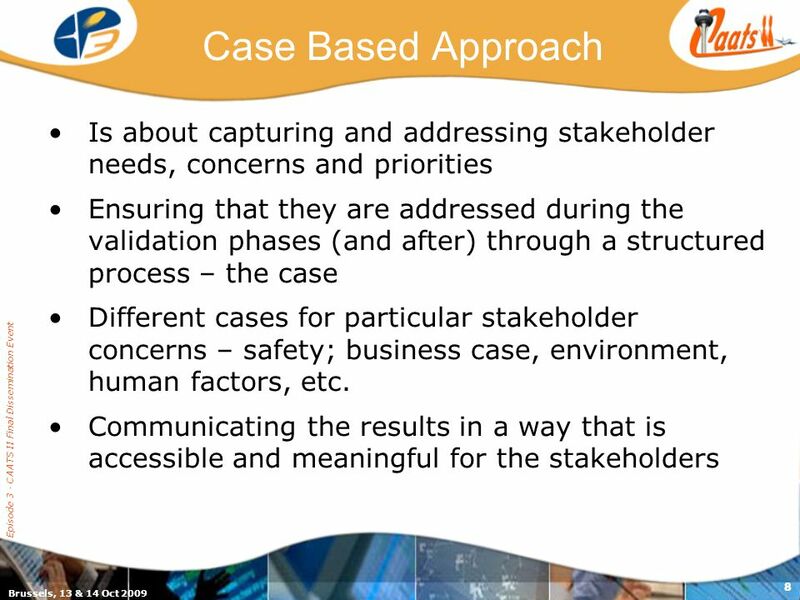 Safety case development in ATM R&D Safety feedback for decision-makers and concept developers Episode 3 - CAATS II Final Dissemination Event Jelmer J.
Update on the Multilateral Effectiveness Initiative James Melanson Director of Evaluation CIDA DAC Network on Development Evaluation June 2013. ANALYSIS PHASE OF BUSINESS SYSTEM DEVELOPMENT METHODOLOGY.